White Cottage Bakery is located in Mark and Helen Underwood’s home, a charming white cottage in the picturesque village of Kingston, Cambridgeshire. 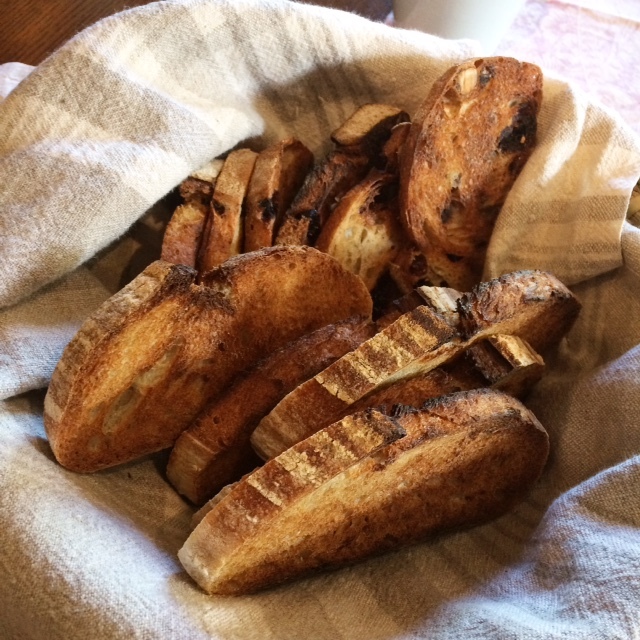 Some of the most amazing bread has come out of that little bakery in Helen’s kitchen. I discovered Helen’s homemade bread last year at my local farm shops and I’ve been a White Cottage Bakery stalker ever since. Getting my hands on a fresh loaf is like winning the lottery! That’s because you can’t just pop into the bakery whenever you feel like it. The bakery isn’t open to the public. 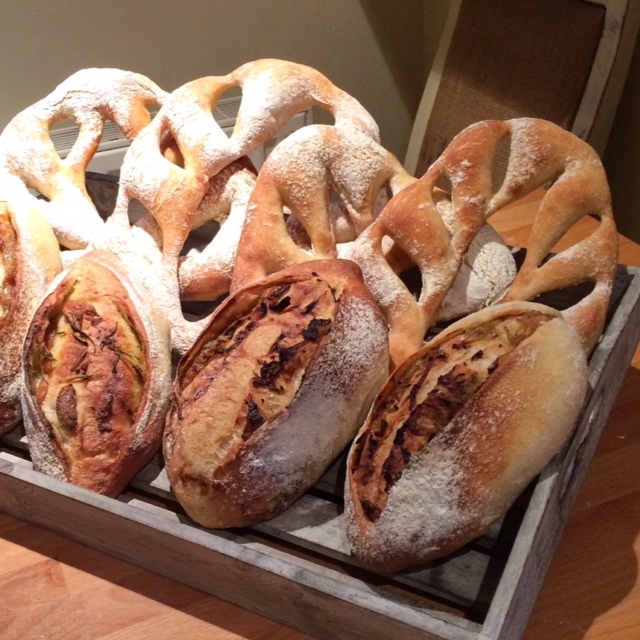 You need to follow White Cottage Bakery on social media (Facebook, Twitter or Instagram) to see what Helen will deliver to select farm shops in Cambridgeshire. Helen bakes the amount of bread she can handle; no mass production there! Even so, it’s a testament to Helen’s passion and dedication to baking that she can produce as much as she does. Helen also runs a series of workshops, which are aimed at groups of 4 to 6 people. 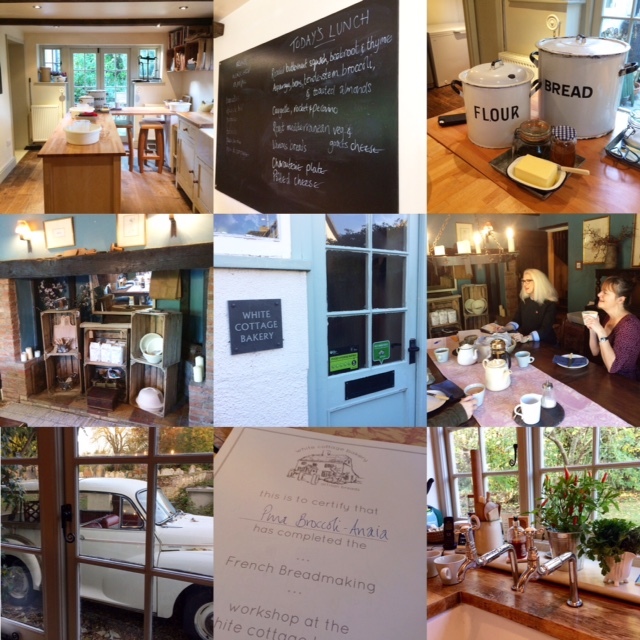 I had the privilege of attending one of White Cottage Bakery’s full-day courses: the French Breadmaking Workshop, held in Helen’s lovely farmhouse kitchen. All of the workshops are taught by Helen, an accomplished (and self-taught!) professional baker with decades of experience. 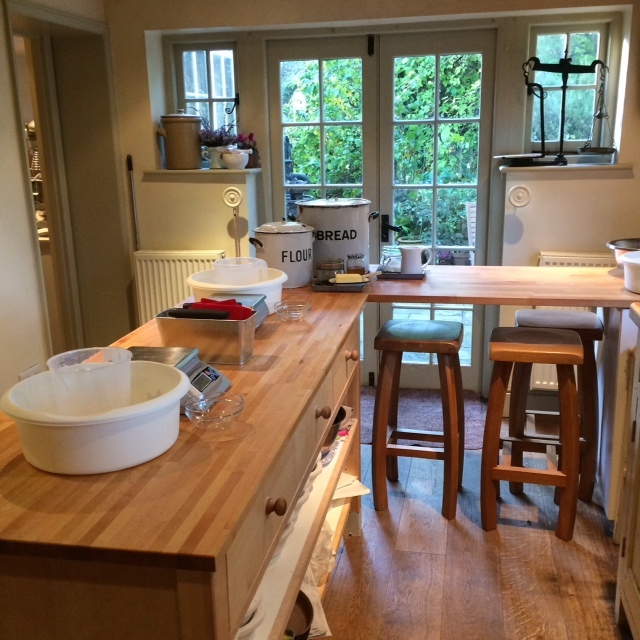 The setting is friendly and cosy, as I was in a home and not a purpose-built cookery school. We were a group of 4 people and we were all made to feel very at home. 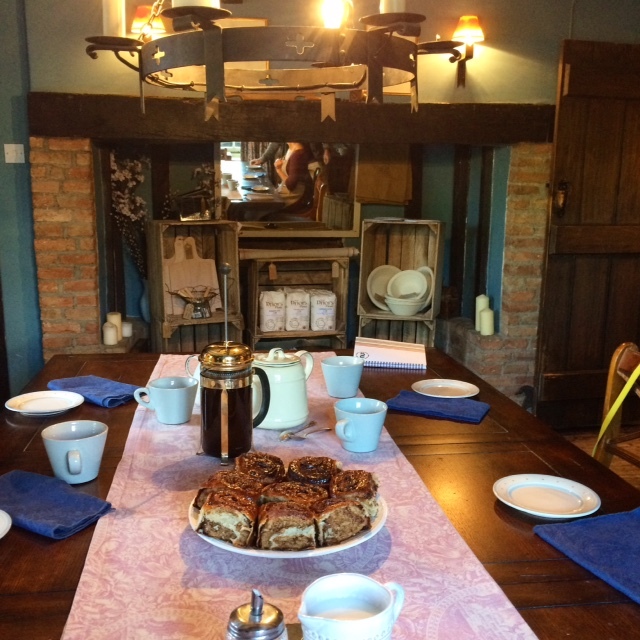 We were led to the gorgeous dining room for a welcome breakfast featuring tea, coffee, jams and the bakery’s own bread. I especially loved the hazelnut and sour cherry loaf. Helen ran through the workshop with the group. 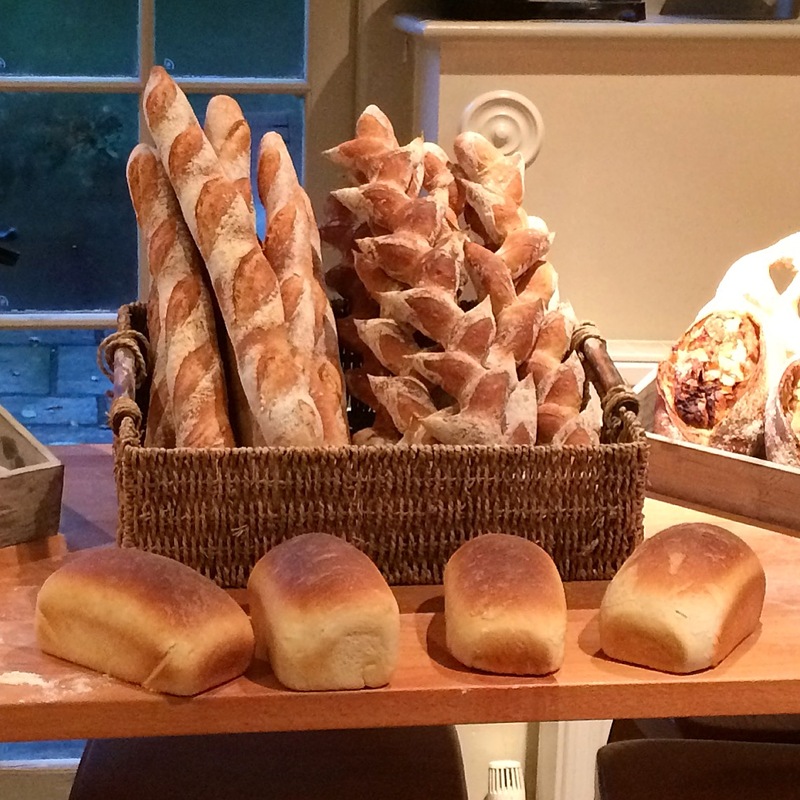 We would be learning to make a lot of French breads… pain de campagne, baguette, bâtard, pain d’épi, fougasse and pain de mie. C’est magnifique! We received our own folders with the day’s recipes as well as blank sheets and a pencil for making notes. As tempted as I was to stay in the dining room and admire all of the lovely artwork and curiosities (there’s even a stuffed badger! ), it was time to begin the workshop. 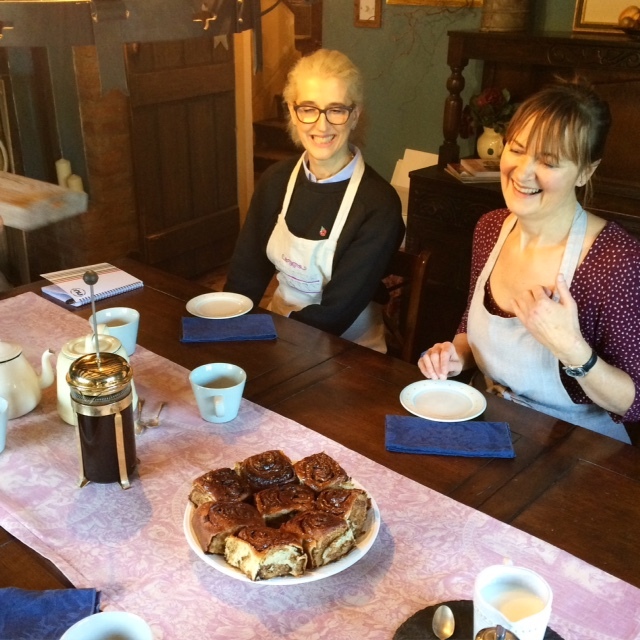 With my energy replenished with cups of tea and fabulous bread, I was more than ready and put on my White Cottage Bakery apron. Helen is a patient instructor and explained everything very clearly. 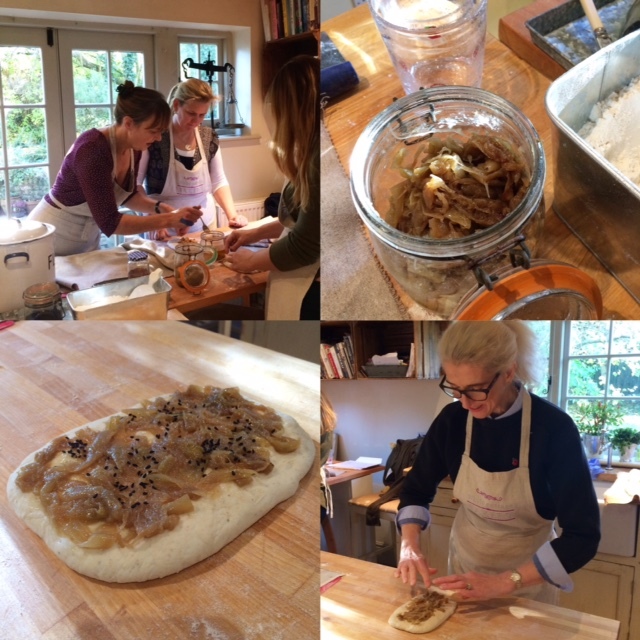 She showed us techniques on “practice dough” and helped us every bit of the way, to ensure we had understood everything. 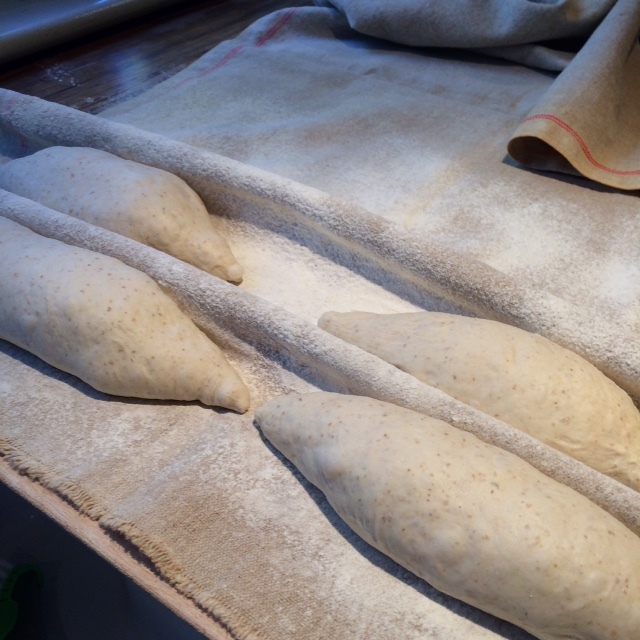 There is so much time, care and skill involved in making a quality loaf of bread… the next time I bite into a homemade baguette I will know exactly the dedication and expertise that went into making it. Baguette – a long, narrow loaf. 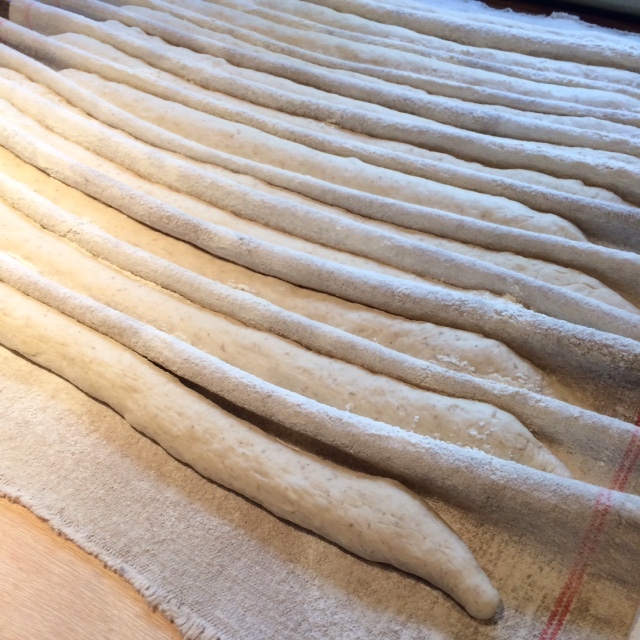 Pain d’épi – a twist on the baguette, the dough is snipped to form a stalk. 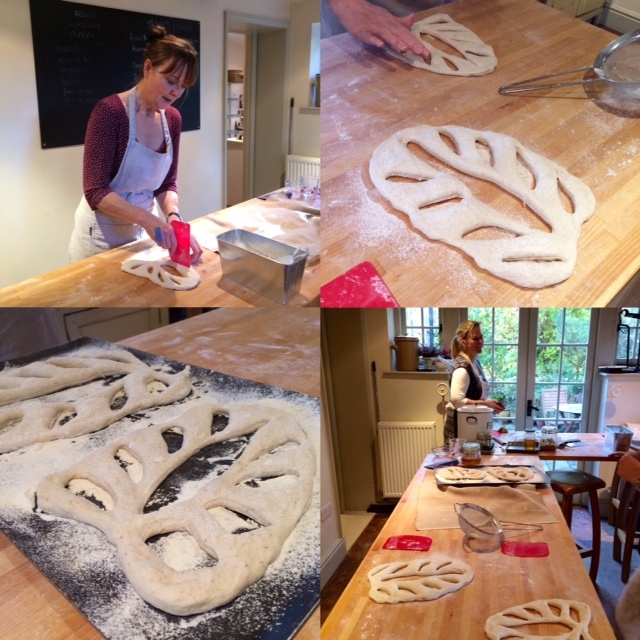 Fougasse – the dough is slashed to resemble a leaf or sheath of wheat. Bâtard – a fat, round version of a baguette. We filled one of them with onions and nigella seeds. 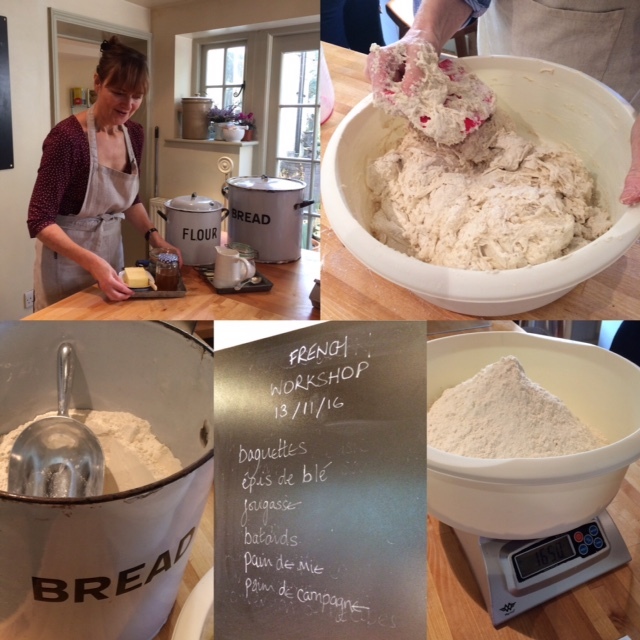 We also prepared recipes for pain de campagne (a large, round loaf) and pain de mie (soft, white bread that is slightly sweet). We learned how to knead, shape and prove the dough. 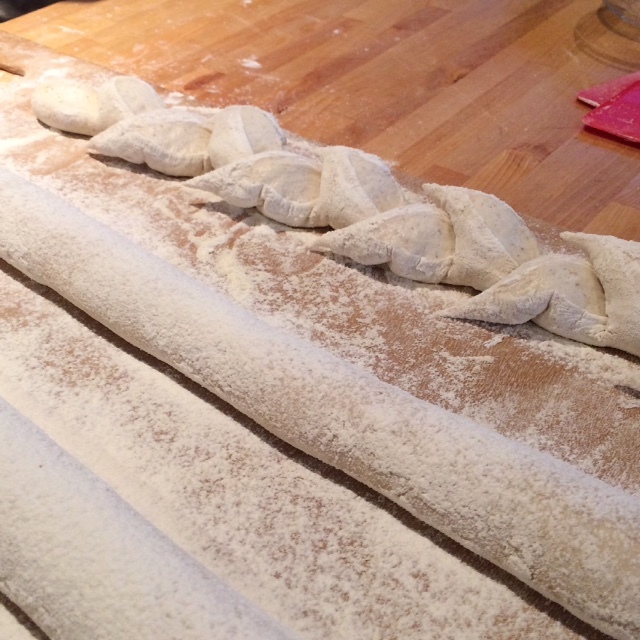 Some of the breads required a couche, a linen cloth rucked together to form gullies for supporting baguettes and bâtards during their final prove. 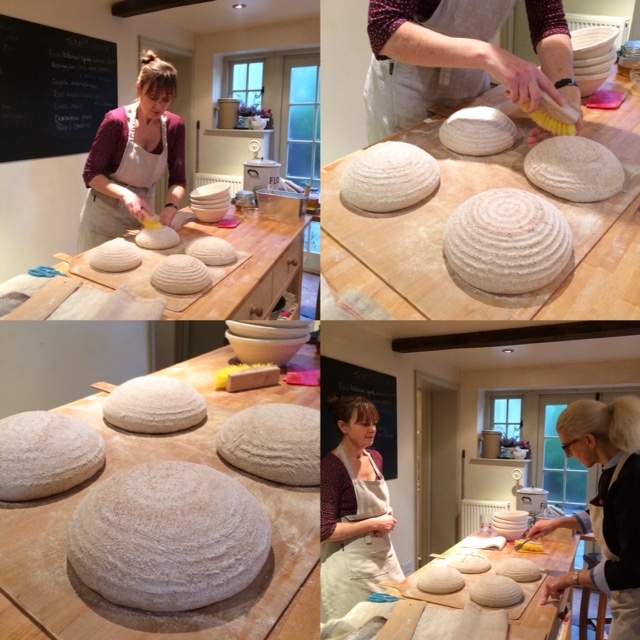 The pain de campagne got its shape from a spiral banneton / brotform proving basket. After its final prove, the dough was tipped out onto a board where we learned the slashing / scoring technique with a blade, called a lame or grignette. 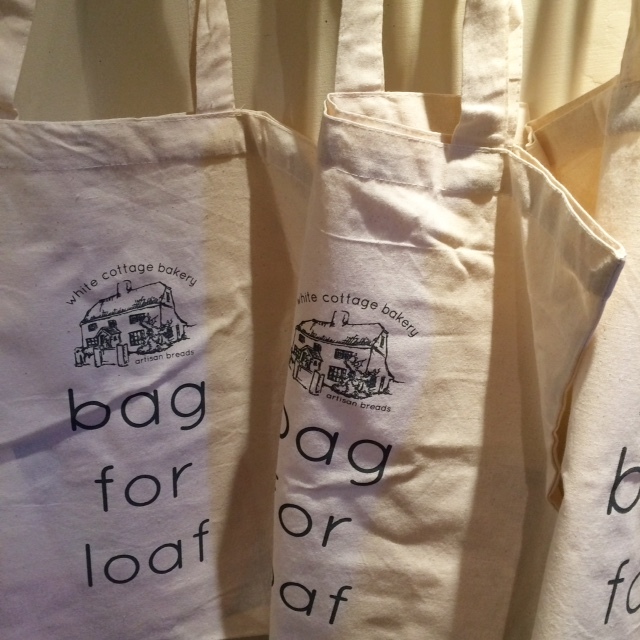 Helen showed us a variety of designs we could choose to personalise our loaf. 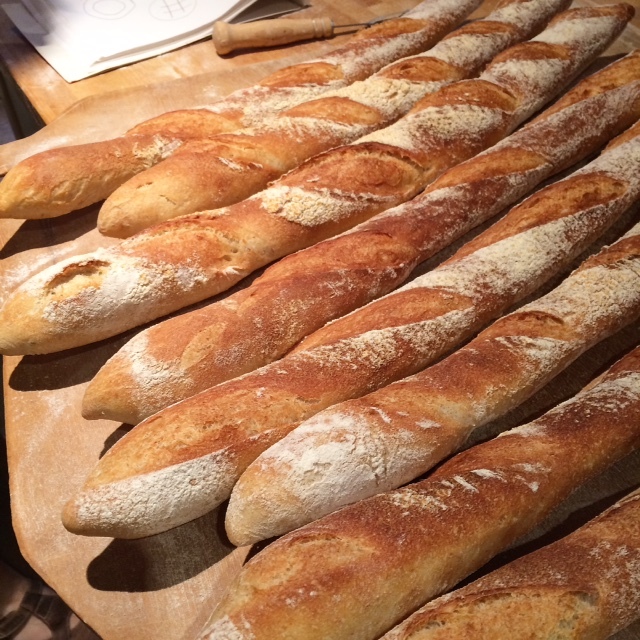 We slashed our baguettes too. Helen baked all of our breads in her professional ovens, even showing us how to steam the inside of the oven in order to create a crisp crust. During all of this, Mark efficiently organised the breaks and ensured all the food and drinks were nicely laid out on the dining room table. 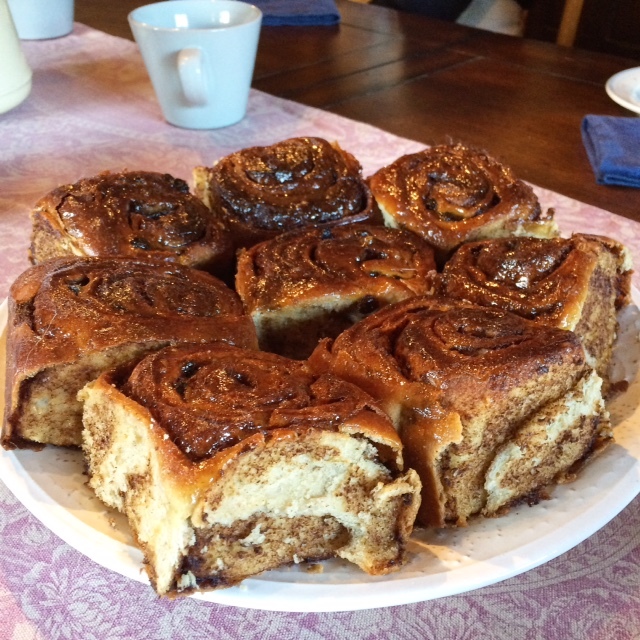 For our tea break, we were treated to Helen’s HEAVENLY cinnamon cardamom buns. They were THE best buns, even better than a certain famous Cambridge bun! Made with spelt, they’re not overly gooey and have just enough cinnamon and cardamom. If you’re lucky you can track these down by stalking following White Cottage Bakery! 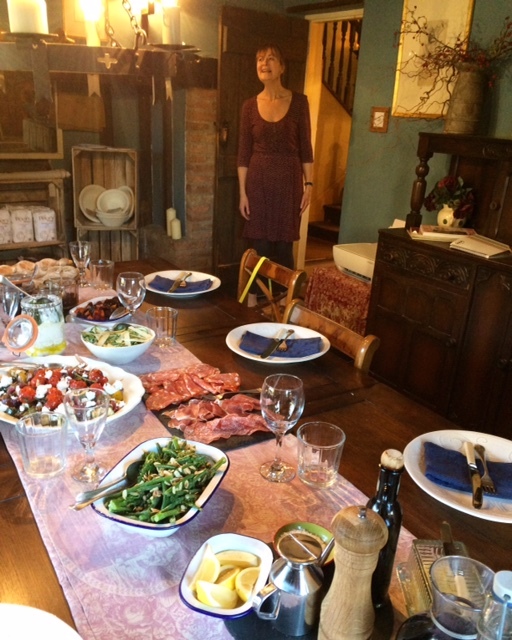 The workshop also included a delicious lunch, complete with white wine if you so desired. 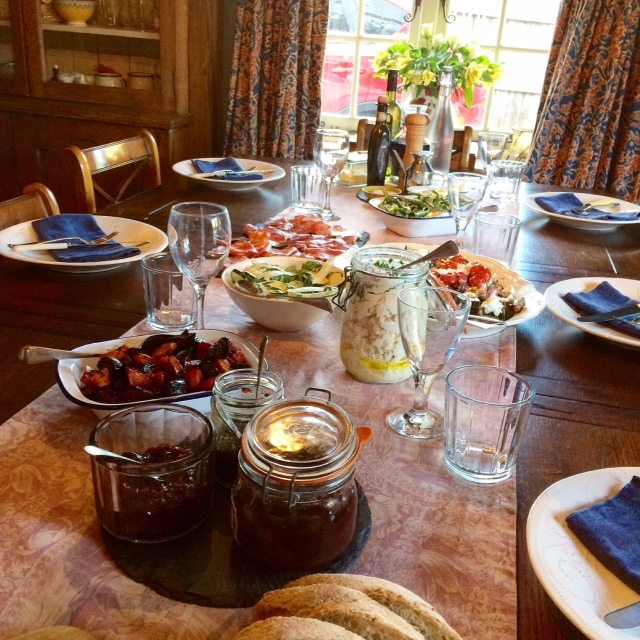 Mark laid out a variety of dishes… a charcuterie plate, assorted breads and Helen’s very own potted cheese – genius recipe! 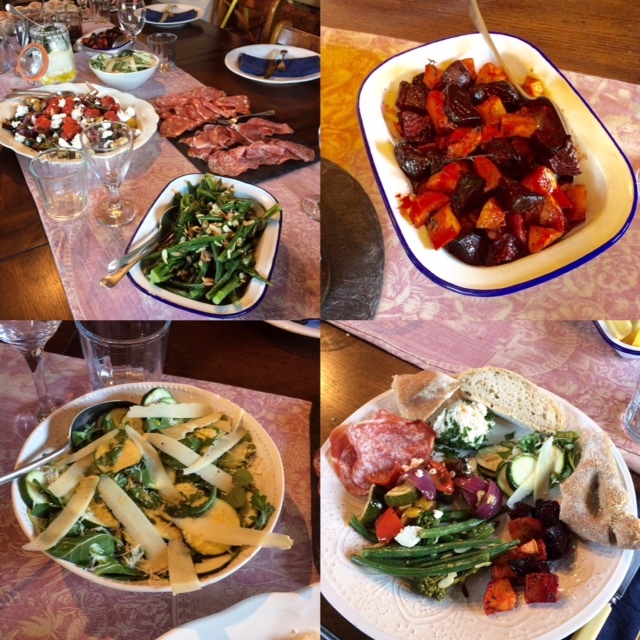 A parade of salads graced the table, such as roasted butternut squash, beetroot & thyme; asparagus, beans, tenderstem broccoli & toasted almonds; courgette, rocket & Berkswell cheese; and Mediterranean vegetables & goat’s cheese. 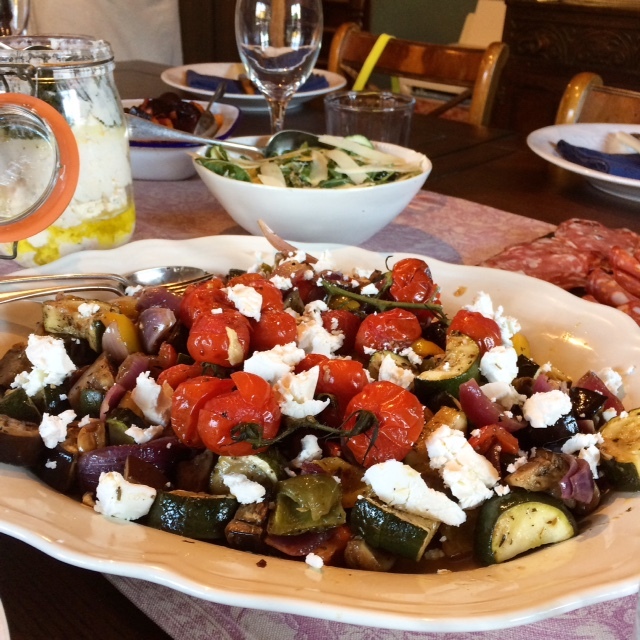 Everything was fresh and full of flavour. 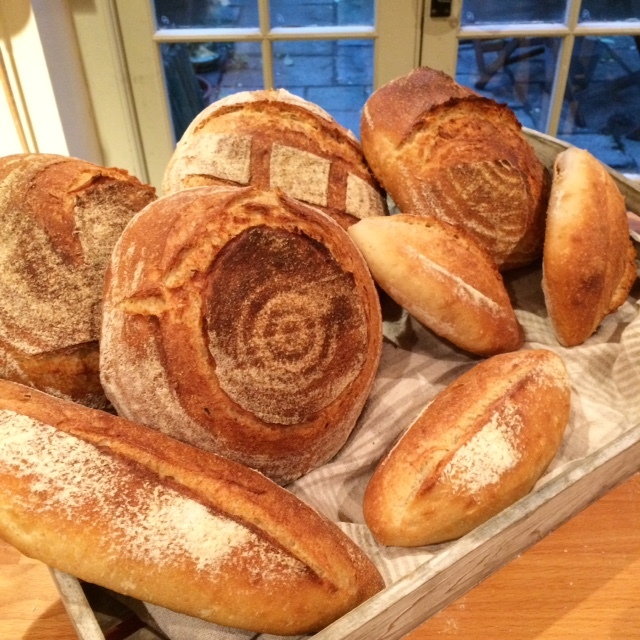 At the end of the day, we re-entered the kitchen to find all of our breads were beautifully displayed on the counter. What a treat to see the fruits of our labour in this way. It was photo session time! We proudly posed for the obligatory group photo. We were given a cute Bag For Loaf canvas bag to carry our folder, dough scraper and any baking supplies that were purchased directly from Helen. We had so much bread to take home that we were given an extra paper bag. 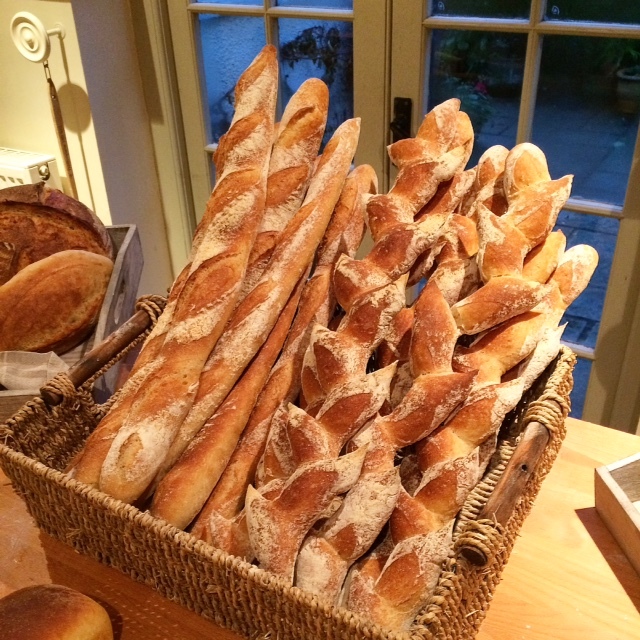 I learned so much about French bread in this excellent workshop. I can’t believe I made such amazing bread. I have a freezer full now! The recipes provided are really easy to follow and I look forward to putting what I learned into practice. 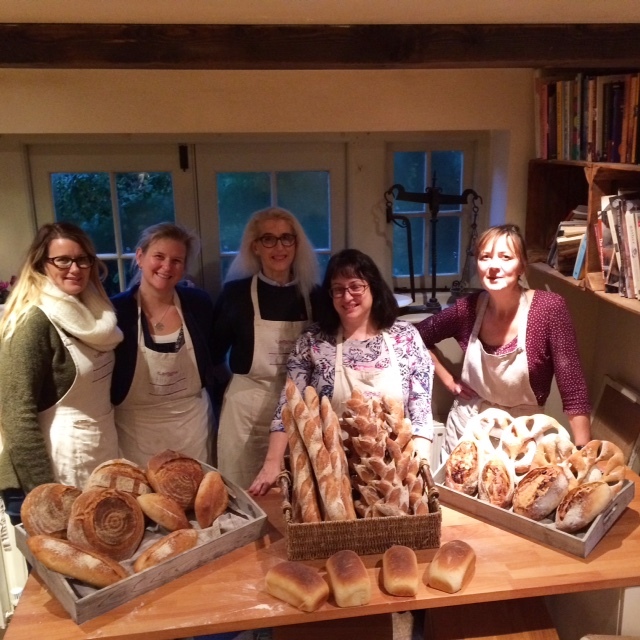 White Cottage Bakery run other courses, such as Italian Bread, Sourdough and Introduction to Bread Making. 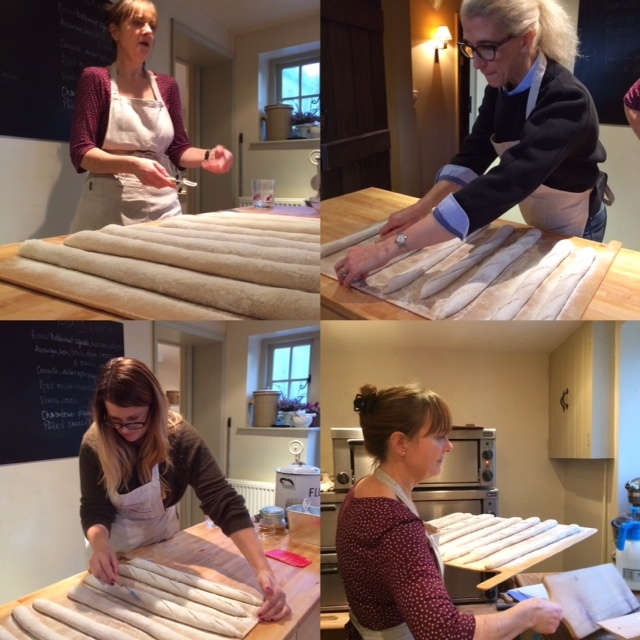 There’s even a Festive Stollen workshop in December. Keep an eye out on their calendar! 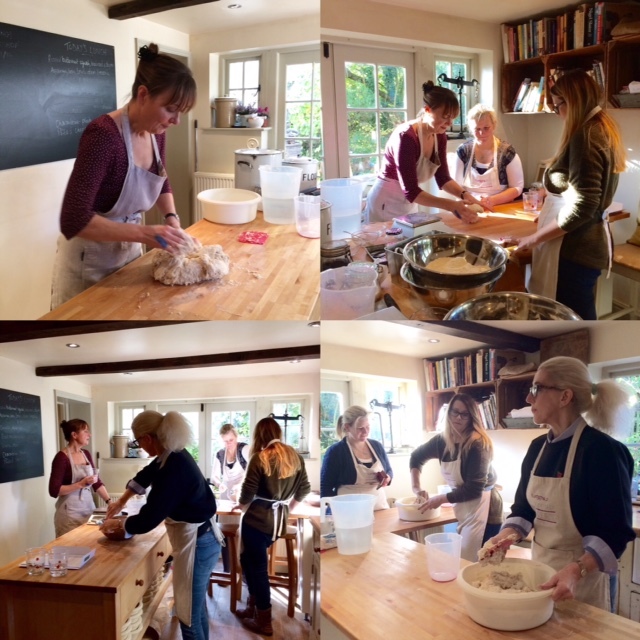 Helen Underwood of White Cottage Bakery kindly invited me to attend the French Breadmaking workshop. Although the course was complimentary, all views are my own. I did not receive compensation for my review. 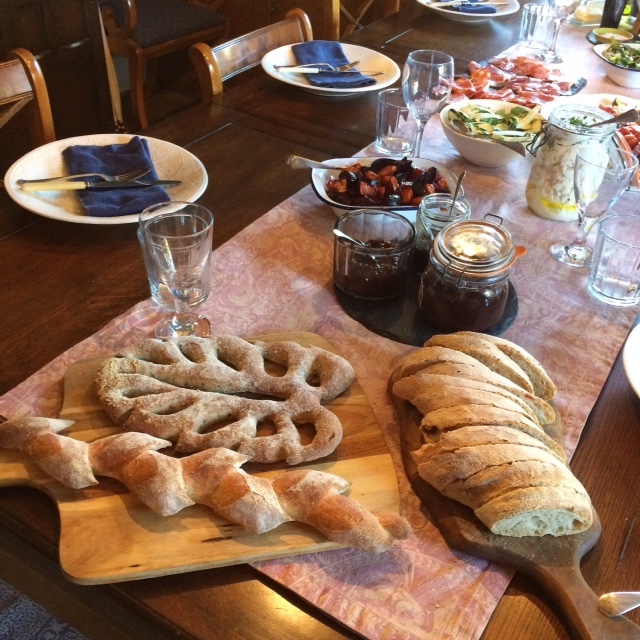 This entry was posted in Food Events and tagged baguette, batards, Cambridgeshire, fougasse, French bread, Helen Underwood, Kingston, pain d'epi, pain de campagne, pain de mie, White Cottage Bakery by One Two Culinary Stew. Bookmark the permalink. I can’t believe you made so much in one day. I shall keep an eye out for other courses as you have really sold this to me! We worked hard but it was a lot of fun. I’ve got my eye on the Italian bread workshop!